Tear Away Arm - The story behind the "Selfie"
We have been working on an intro video for our upcoming "Indiegogo" campaign. During one of our initial meetings some one said "Wouldn't it be funny if we ripped your arm off and you just kept talking". Well, we thought it might amuse people so we got to work. Here is a quick look at the process. Rick carefully making sure the plaster picks up all the detail. 2 things to note: 1) notice the flange between the 2 parts, this is where we will clamp the mold together when it gets cast. 2) That orange on the bottom flange is shellac used to seal the mold (again SOoooooo "old school"). This will keep the 2 parts from sticking to each other. Next we built an armature to work as the bones for the arm. It's basically some scrap wood, hinges and copper wire. This will be cast inside the foam. A bit tricky because it needs to be suspended in the center of the mold prior to casting. A better shot of the armature. The next step is to cast the arm. We decided a latex skin over a soft foam would be best. 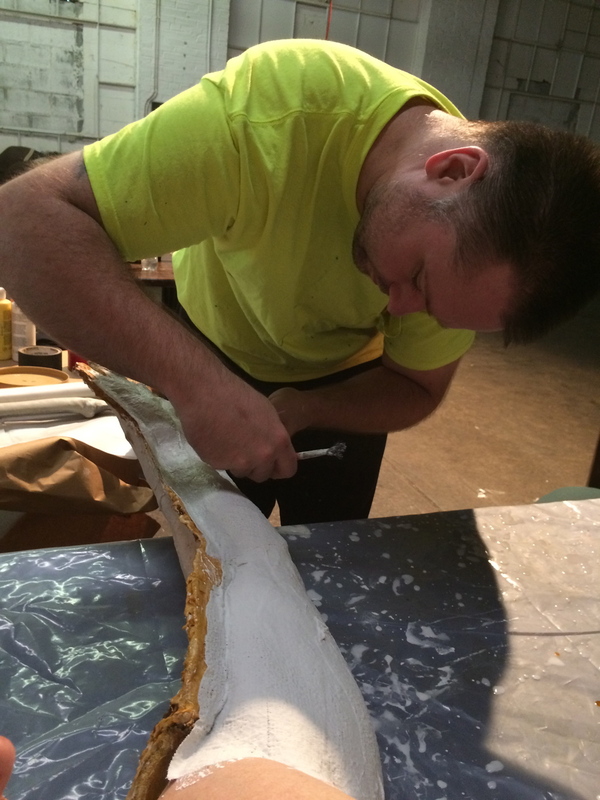 Both halves of the mold were coated with several layers of pigmented latex and set to dry. We then suspended the armature in the mold, clamped the 2 halves together and got ready to cast the arm in expandable foam. Ready to cast. Sorry there are no pictures of this part of the process but it gets rather manic due to the short pot life (50 secs) and just how fast that foam begins to expand as you are pouring it... it's a "put down your phone...all hands on deck" few minutes in the shop. It's always a little nerve wracking when it comes to prying apart the mold. Did we get a complete cast? Will there be missing fingers or air pockets? Will the armature be poking through? Thankfully all went well and we have good replica. We used pigments mixed with latex to keep the surface flexible. Detailing the freckles on the foam arm. So you think we might be finished now... but what fun would a severed arm be without a blood spurt! Our next job was to build a rig to attach the arm to the actor. This was carved out of cushion foam and hollowed out to fit around the real shoulder. A strap was added to secure the rig to the actor. The arm was severed just below the sleeve line of the T-shirt he would be wearing. The bladder for the blood was made from some tubing and a couple of "punch-ball" balloons. All of this was secured into the hollow shoulder. Wearing the rig for the selfie. Hopefully that explains it. We have practiced with the rig and it seems to be working just fine. We begin filming on Monday... keep your fingers crossed that all will go well. It was a heck of a lot of work for 10 seconds of video... but if it makes people laugh it will all be worth it.